The Cambridge Veterans’ Organization (CVO) and Cambridge Veterans’ Services will hold their annual Memorial Day Parade and Observance on Monday, May 25, 2015. The Parade will begin with a cannon salute by the MA Bicentennial Battery at 9:30am, on the Cambridge Common and proceed through Harvard Square, up Mount Auburn Street to Coolidge Avenue, and conclude at the Cambridge Cemetery on Coolidge Avenue. Cambridge Mayor David Maher and CVO President Philip Anderson will serve as parade commentators. Parade participants will include: veterans’ groups, elected officials, police and fire personnel, color guards, bands, drill teams and youth organizations. Following the parade, a Memorial Day Observance will be held at the Cambridge Cemetery. (Approximate start time: 11:00am) CVO President Philip Anderson will serve as Master of Ceremonies. CVO Chaplain Paul Kim will give the Invocation and Benediction and City of Cambridge Police Sargent and Massachusetts Army National Guard Veteran Maj. Thomas Glynn will deliver the keynote address. Mayor David Maher will give the greetings of the city and City Councillor Marc McGovern will read the City Council’s Memorial Day Resolution. Amigos School 4th graders will lead the audience in the Pledge of Allegiance and a CRLS Drama student will read the Governor’s Memorial Day Proclamation. Following the memorial observance, the Women’s Auxiliary of the Veterans’ of Foreign Wars accompanied by local elected officials will hold a brief memorial ceremony at the Weeks Bridge in honor of the Cambridge servicemen and women who were lost at sea. The public is cordially invited to attend all of the Memorial Day events and activities. Immediately following the day’s events, a collation, hosted by the Cambridge Veterans’ Organization will be held at the VFW Mt. Auburn Post, #8818, located at 688 Huron Avenue. THERE IS VERY LIMITED PARKING AVAILABLE AT THE VFW. COLLATION ATTENDEES ARE ENCOURAGED TO RIDE THE VETERANS TROLLEYS THAT WILL BE LOCATED AT THE CEMETERY. THE TROLLEYS WILL RETURN YOU TO THE CAMBRIDGE COMMON OR THE CEMETERY AFTER THE COLLATION. For further information, please call Cambridge Veterans Services at (617) 349-4761. See how Cambridge’s second largest park came to be, from an island surrounded by marshes to a gunpowder depot and, later, a favorite Charles River swimming beach. As a public space, the site has inspired many plans and schemes. Consider the courses taken and passed by as we plan for the park’s future – this year. Magazine Beach – Its History and Your Stories! 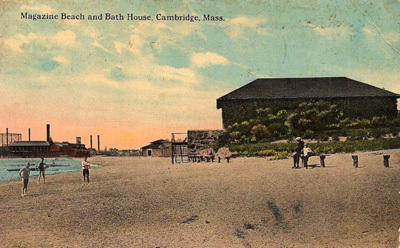 Magazine Beach Park, at the bottom of Magazine Street, is Cambridge’s second largest park, and it has long been a favorite swimming and picnicking site. Hear about its long history, about Captain’s Island and its powder magazine, and its becoming a popular beach for Charles River bathers. We’re eager to hear your stories, too! While the Esplanade has long been the jewel on the Charles, the Cambridge river parklands, at long last, are beginning to receive their due. Hear the latest about North Point Park’s skate park and Magazine Beach and Greenough Boulevard improvements. Presenters from the Charles River Conservancy, Solomon Foundation, Cambridgeport Neighbors Association’s Magazine Beach Committee, Mass. Dept. of Conservation & Recreation (DCR), and the City of Cambridge will share current projects. Cambridge Fire Department, along with PRO EMS of Cambridge, have jointly received the American Heart Association’s Mission: Lifeline® EMS Silver Award for implementing quality improvement measures for the treatment of patients who experience severe heart attacks. “Cambridge Fire Department and PRO EMS are dedicated to making our units among the best in the country, and the American Heart Association’s Mission: Lifeline program is helping us accomplish that by implementing processes for improving STEMI systems of care with the goal of improving the quality of care for all STEMI patients,” said Cambridge Fire Chief Gerry Reardon. “We are pleased to be recognized for our dedication and achievements in emergency medical care for STEMI patients.” For more information, contact Assistant Chief Gerard Mahoney, Phone: 617-349-4970. For more information about the program, visit: heart.org/missionlifeline. May 21 – The Massachusetts Library Association (MLA) presented the 22nd biennial public relations awards to the winning applicants at the Association’s Annual Conference at the DCU Center in Worcester, Massachusetts. Winners were chosen by a panel of independent judges from the public relations, advertising, press, and graphic design fields. Evaluation criteria included messaging, originality, and presentation. Entries were submitted for 20 categories, including brochures, community reading programs, social media, and Websites. 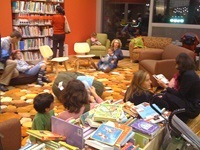 The Cambridge Public Library received five awards in the logo, booklist, community reading program, summer reading program, and newsletter categories. The Library also received first prize in the merchandise category for its tote bags promoting library confidentiality. Library graphic designer, Luke Kirkland was presented with the awards by the MLA Public Relations Committee at the 2nd Annual Awards Gala and Dinner. "The Cambridge Public Library is proud of Mr. Kirkland’s work which is visually engaging and representative of the highly professional programs and services offered to our community," said Susan Flannery, Director of Libraries. Last year, the Cambridge Public Library checked out 1.4 million items and offered 3,000 programs to more than 87,000 individuals. The Massachusetts Library Association advocates for libraries, librarians, and library staff, defends intellectual freedom, and provides a forum for leadership, communication, professional development, and networking to keep libraries vital. MLA has been working libraries for over 100 years, representing members from all library types in the Commonwealth. For more information visit www.masslib.org. May 21 – Today, Mayor David P. Maher announced that 2015 marks the 25th Anniversary of the City of Cambridge’s Pride Brunch, a tradition that honors the service of individuals working toward equal access and social justice for Lesbian, Gay, Bisexual and Transgender people. This year, Mayor Maher, along with the City Administration and the Cambridge GLBT Commission will hold the event in the Sullivan Chamber in Cambridge City Hall on Saturday, June 13 at 9:00am, at 795 Mass. Ave.
Refreshments will be provided and the annual program celebrating the progress for Gay, Lesbian, Bisexual and Transgender people in Cambridge will begin at 9:30am. The program will include a ceremony presenting the annual Bayard Rustin Award to a person of color with an outstanding history of service to the Cambridge GLBT Community. Community recognition awards as well as the Rose Lipkin award to a Cambridge Rindge and Latin School student will also be presented. Bus transportation will be provided to the Boston Pride Parade after the Brunch, departing Cambridge City Hall at 11:15am. RSVPs to this event are appreciated (but not required) and can be made to Mayor Maher’s Office at (617) 349-4321 or mayor@cambridgema.gov. StoryWalk Cambridge – Can You Find all the Pages? (Behind King Open School, between Willow and Berkshire streets). The Agenda for Children, the Center for Families and the Cambridge Health Alliance invites families to come and join us for a reading adventure at Donnelly Field. Pages from the children’s books Forest Bright, Forest Night and One Hot Summer Day will be posted along the field. Parents and kids can enjoy free pizza, books, arts and crafts, along with a special performance by Silly Sally. For more information about StoryWalk, contact Priscila de Calvache at 617-665-3825 or pcardoso@challiance.org. The Community Preservation Act Committee will hold a public meeting Tuesday, June 16, at 6:00pm, at Cambridge City Hall, Sullivan Chamber, 795 Mass. Ave. The meeting agenda will include providing the public an opportunity to suggest and recommend projects for CPA funding for Housing, Open Space and Historic Preservation in FY16. For more information, contact Karen Preval at 617-349-4221 or kpreval@cambridgema.gov. 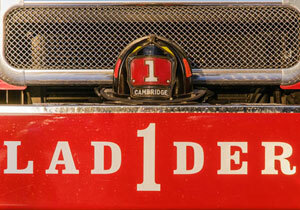 The Cambridge City Manager is seeking volunteers to serve on a new Foundry Advisory Committee that he is establishing. This group will advise and provide regular updates to the City Manager as well as providing regular updates to the Executive Director of the Cambridge Redevelopment Authority (CRA) on proposed uses within the Foundry building, which will be redeveloped and operated consistent with the vision and objectives that grew out of an extensive community planning process. In evaluating potential uses, programs, and use of shared spaces for creativity and innovation at the Foundry, the Committee will take into account the interior configuration, ongoing operations, changing demand and market forces, updates in technology and innovation, and other outside impacts. The Committee will also review any proposals for significant capital changes to the building as they affect the Foundry’s objectives. Meetings are anticipated to occur quarterly, although more frequent meetings may be required in the initial stages of the redevelopment process. The Committee will provide annual updates to the CRA Board at regular Board meetings, which will provide the public with information regarding its activities and provide a forum for input. Members of the Committee will be initially appointed by the City Manager to staggered terms of 1-3 years. The City Manager seeks individuals with demonstrated ability to work effectively on a team with diverse opinions to craft consensus recommendations. The City Manager’s intention is to create a committee that includes experience and expertise in related topic areas, as well as representation from various neighborhoods within the city, and local non-profit and community organizations. May 18, 2015 – Today, Mayor David P. Maher and City Manager Richard C. Rossi announced a partnership with the Volpe National Transportation Systems Center to install truck side guards on city-owned trucks in order to enhance safety for pedestrians and bicyclists traveling in Cambridge. 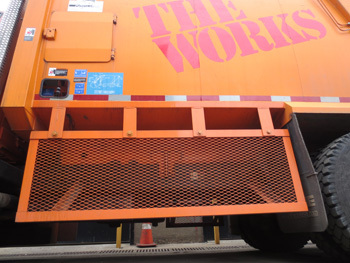 The city intends to install these side guards on heavy-duty vehicles in an effort to lead by example in Massachusetts and to encourage private entities to do the same. These efforts dovetail with the U.S. Department of Transportation’s Mayors’ Challenge for Safer People and Safer Streets, which was launched on Jan 22, 2015, by U.S. Transportation Secretary Anthony Foxx. “Cambridge has always led the way with progressive multimodal transportation options for our residents. Now we are stepping up once again to lead the charge to make our streets safer and to mitigate the deadly consequences of common traffic collisions,” said Mayor Maher. Side guards, which are installed on large trucks to protect bicyclists and pedestrians from falling underneath the vehicle, helped reduce bicyclist fatalities by 61 percent and pedestrian fatalities by 20 percent in side-impact crashes with trucks in the United Kingdom after side guards became required, starting in 1986. Side guards are devices intended to sweep aside a pedestrian or bicyclist in a side-impact crash, rather than being swept underneath the vehicle. 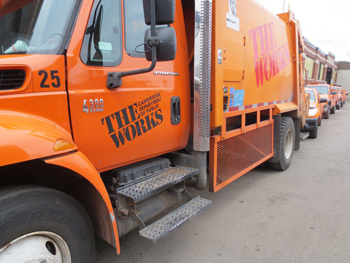 Integrating the recommended safety countermeasures into the vehicle bodies and operations of the city’s truck fleet, on up to 50 identified vehicles starting in the fall of 2015, to lead by example and to encourage the private sector truck fleets to follow. This initiative was brought to the attention of the City of Cambridge from social media. By coincidence, a member of Mayor Maher’s staff was walking by the scene of a crash sometime after a bicyclist had collided with a garbage truck. Thanks to the quick response of emergency personnel, the young father who had been on his bicycle was already being treated at a local hospital. Crews had started to remove the twisted frame of the bicycle from underneath the truck when Alanna Mallon, from the Mayor’s Office, walked by. She posted a picture of the bicycle frame on social media, which happened to reach Alex Epstein at the Volpe Center. Within an hour of the picture being posted, Dr. Epstein was on the phone with the Mayor’s Office to arrange a meeting about the potential to work with Volpe on installing truck side guards. Not only was a meeting arranged with the City Manager, Deputy City Manager, Commissioner of Public Works, and Police Commissioner about this effort, but Dr. Epstein also testified at a Cambridge City Council meeting shortly after speaking with the Mayor’s Office to expand the dialogue about implementing truck side-guard solutions. City Hall, Sullivan Chamber, 795 Mass. 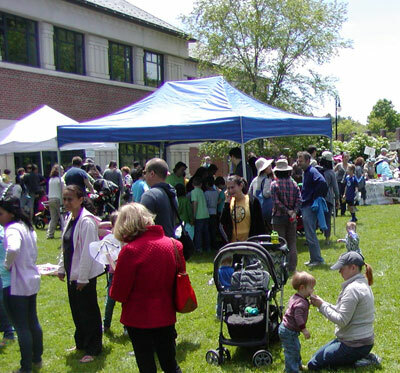 Ave.
Join the Cambridge Water Department at its 8th annual Fresh Pond Day on Saturday, May 30, from 11am-3pm to celebrate Fresh Pond Reservation, Cambridge’s in-city drinking water reservoir and urban wild. This event is free and open to all; all dogs must be leashed. The festivities are held around the Water Treatment Facility at 250 Fresh Pond Parkway. Use of public transit and bicycles to get to the event is strongly encouraged, especially for those wanting to participate in the bike parade! Visitors arriving by car are asked to park at the Tobin School on 197 Vassal Lane. Fresh Pond Day is an occasion for all ages to jubilate in honor of Fresh Pond Reservation, which protects the City’s drinking water supply, is critical wildlife habitat, and provides Cantabrigians with a green, recreational oasis. All-day highlights include: live music by Lux, Second Line Social Aid & Pleasure Society Brass Band, and the Wicked Pickers; kids’ activities, StoryWalk and book giveaway; face painting; truck climb-aboards; bike tune-up and flair stations; dog training clinics; pedi-cab rides; a chance to meet and greet with City staff and community groups; and more! Feel free to bring a picnic. Rain does cancel the event. For schedule and weather updates, and to get involved, visit www.cambridgema.gov/freshpondday, or contact Kirsten Lindquist at 617-349-6489, klindquist@cambridgema.gov.